Black Bird Yellow Sun operates on several levels, more complicated than you might think a simple board book would be. But that's what makes this book one a parent can read over and over to a young child and each time there can be a different story. The first and most obvious narrative is the story of the crow's day, from walking up to the yellow sun to sleeping under the blue moon at night. The second story is one of colors. Bird, of course, remains black, but throughout the day, Black Bird encounters colors. The day is in fact defined by colors from flying through orange leaves to eating purple grapes. What colors would young children choose to define their day? How would you describe your day in colors? It is an interesting concept, and one that is perfect for the intended age group. The last story is the most subtle. Not mentioned at all, but present on every single page, including the front cover, is a small orange worm. Everywhere Black Bird goes, Orange Worm goes, too. At first, this reader worried for Orange Worm. Worms, after all, are snacks for birds. But Black Bird does not even seem to notice Orange Worm. Somehow, through the pages, Orange Worm changes from being possible lunch or dinner into friend. Orange Worm has no face, nothing to show expression, but the cozy way Orange Worm curls up with Black Bird under the Blue Moon suggests a close companionship. Will readers notice Orange Worm the first time they flip through the pages? Or will the worm story be a surprise only discovered after many readings? Either way, this small touch speaks volumes about the richness of even the simplest of board books. 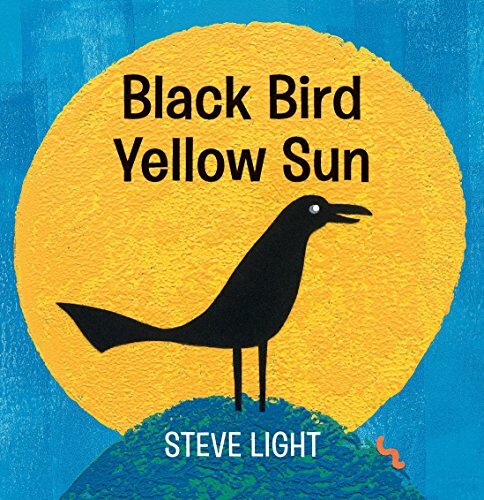 Black Bird Yellow Sun succeeds on many levels and is sure to become a favorite board book, sparking a strong sense of story in the littlest readers.